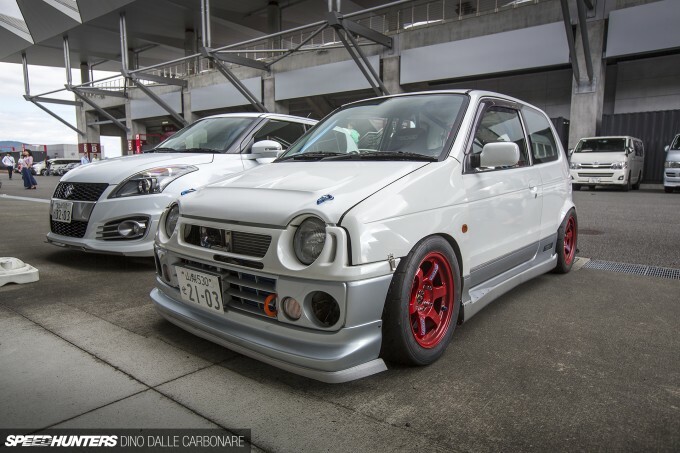 It’s probably going to surprise you, but my final spotlight from the recent R’s Meeting at Fuji Speedway isn’t even a GT-R. As crazy as that may sound, when I stumble upon cars like this Suzuki Alto Works in a parking lot, I owe it to you guys to share it. 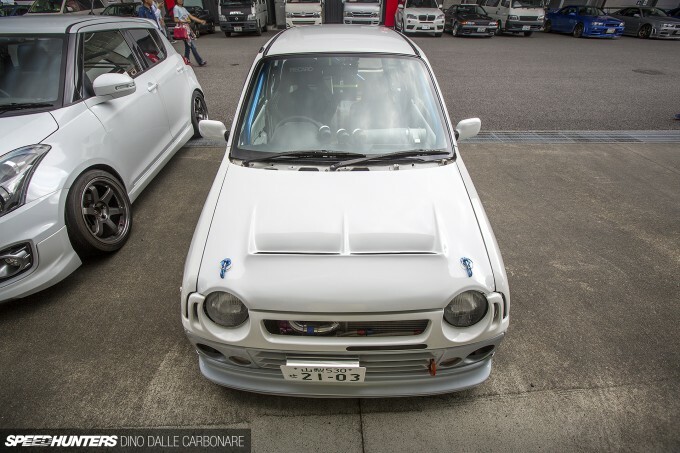 Because this is as Japanese as a tuned car can possibly get! 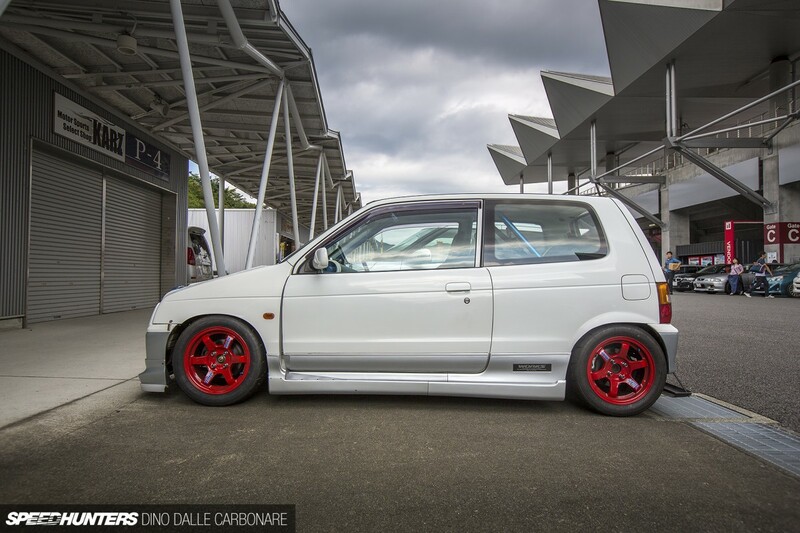 Everything about this tiny little car just seemed so right; from its purposeful stance to the red 14-inch RAYS Volk Racing TE37s that were barely contained by the gently-widened arches. Actually, the rears were more than gently massaged to accommodate the aggressive offset, more like properly modified with welded-on flares. Each corner was shod with Yokohama Advan A050 semi-slicks in a tiny 185/55R14 size. And as you can see from the panel gap by the door, the fenders were pushed out on spacers to give the front end a widened look that perfectly contains the wheels. The front end boasted some sort of aftermarket lip and splitter section, and a vented FRP bonnet. It certainly looked like there was some serious stuff happening in the engine room too – just check out that intercooler and the custom piping. Keen-eyed readers may have noticed the most obvious thing about this car – that it’s no longer running yellow number plates, hinting at the fact that the little Suzuki F6A turbo 3-cylinder engine may have grown in size from its stock 657cc capacity, and therefore the Alto is now not entitled to be registered/taxed under Kei ‘light’ car regulations. The owner has even built a custom diffuser for the rear. 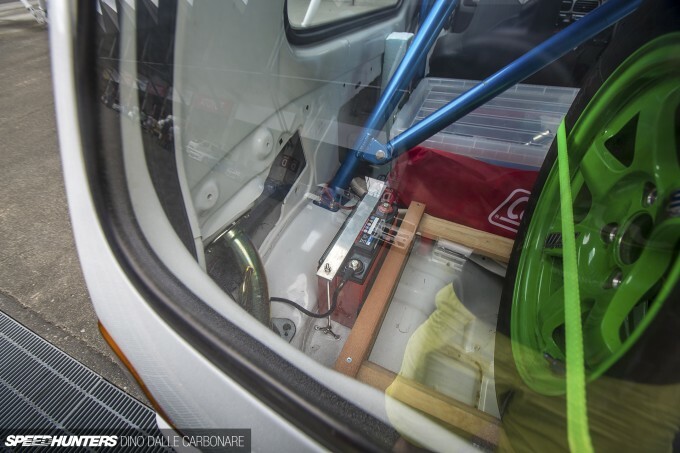 A quick glance through the rear window revealed the rear seat had been ditched for some miscellaneous items, including a tool box, a helmet and a pair of spare wheels safely latched onto the rollcage. I even spotted a lightweight Odyssey battery in the back! 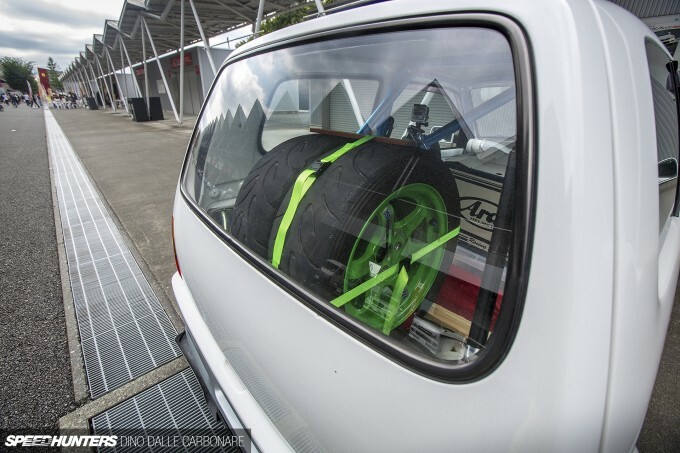 The reason for the relocation could be for weight distribution over space, as I’m pretty sure an enthusiast (read: otaku) that would do this sort of stuff to a little Alto Works may be the same type of person who would corner-weight their car to get the handling spot on. Yep, it’s pretty serious in the office too, topped off with an HKS F-CON V Pro engine management system, auxiliary gauges, a short shifter and an electric fan as the A/C has probably been ditched. It might have been the R’s Meeting, but I’m sure you’ll agree this is one little car that deserved a big spotlight! How much power she punching? Very cool little item. 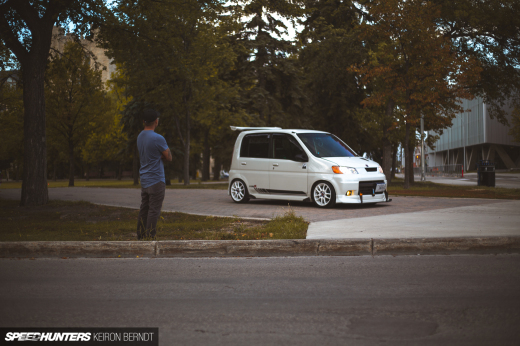 Put a fit and fiat to shame! Love it, gives me the right vibes. Little trunk with whole wheels in it is pretty awesome. I could have much fun in this little firecracker. Photos are cool too, love the white/red/black theme. 1:42 amOctober 3, 2015 Tim. Looks like it would be a fun little weapon for the tighter stuff. Just picked up an 09' Fiesta as a work hack....stuff like this makes me want to fix her up a bit! haha. 1:43 amOctober 3, 2015 Tim. Just a guess, but somewhere north of 150bhp. seen a couple of these over the years. Unless of course they have gone and shoved something much nicer down its throat! we want MOAR about this little beast! I want to see more if this, especially under the hood! SteveBeing Cooool looking! Can you post more picture, i've the same car and yours look pretty legit! Those little cars got a big spot in my heart. 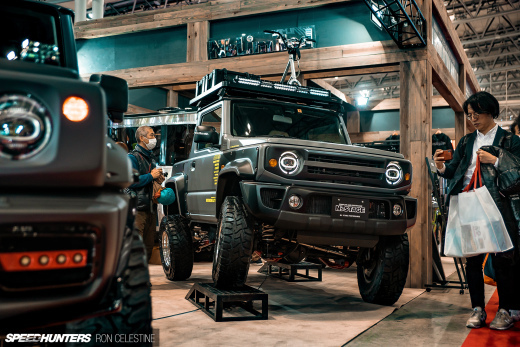 I need to experience Japan and see these types of vehicles in their natural habitat. I'm actually trying to imagine how the car would look using the green spares out back against the red up front. I am so in love with this little babby. Nice to see you drifting on VB mountains Dino! Sweet little monster!!! I love it! quarter mile. It has a top speed of 180 km/h (112 mph). Oh man I would LOVE to drive this if I physically fit! Ah Japan the only country which supplies decent tyres for 13 and 14in applications. In some countries the support for kei-size tyres is non existent! John Key NZ That's because Kei sell extremely well across Japan, so there's got to be support. Plus so many people like to customize their cars! speedhunters_dino Yeah, in reality this would most likely be the case. I currently run 15" wheels with very low profile tyres on this little car - although it did wonders for the handling I do have scrapping and rubbing issues. When I restore and modify (restomod) this trusty little pony, I will most likely downsize to 14" with chunkier rubber. Nice build. Funny thing is the owner is probably not close to finishing it. The car looks like stupid fun. Australia has some good small slicks. I run 195/45/14 on the front of my Caterham. 215/45/16 on my RalliArt Colt and there is an array of 13" for the mini guys. Would love to know what kinda punch this little ripper is packing. Looks cool AF. speedhunters_dino John Key NZ I'm trying to find, just for kicks, off-the-shelf non-drag rubber that comes in 265/45R15 (fits perfectly into an ND miata). Impossible in the US. For those wondering why the ridiculous dimensions, it's because of rotational inertia. A 15x9 wheel/tire combo weighs about the same as stock, but since the wheel weighs so much less, that much more torque turns the tires instead. Also, fat tires are cool. And feel a lot better over potholes. 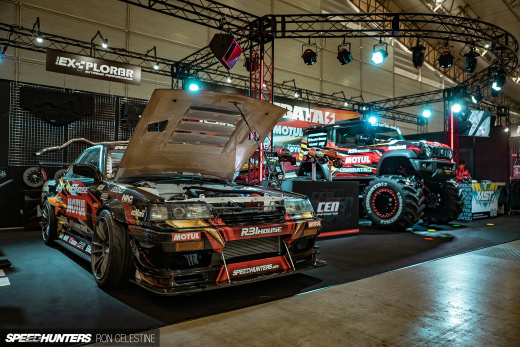 The best you're going to get in a street compound are the maxis 245s 40 15s 200tr that come out late 2016.